Anybody know why there's no chubby 2's or 3's in any color not available? (02-23-2017, 01:47 PM)Chaddy Wrote: Anybody know why there's no chubby 2's or 3's in any color not available? 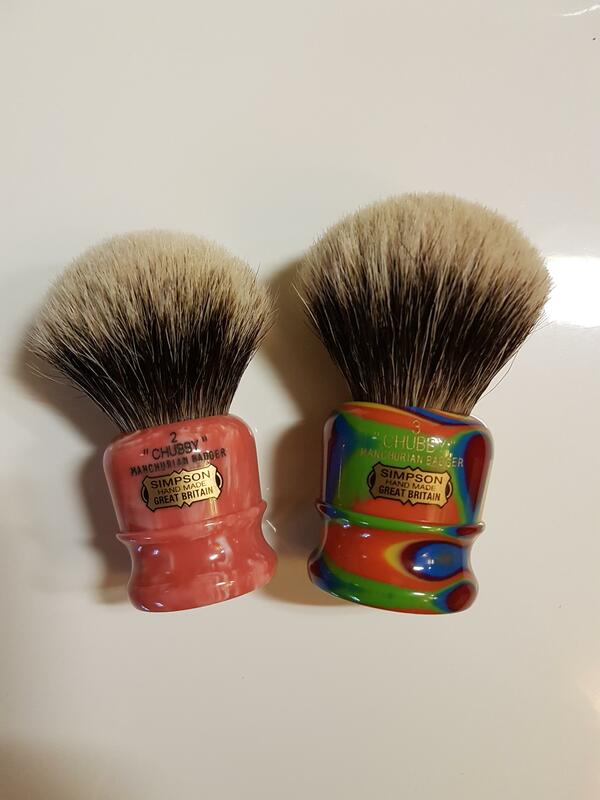 On the website it's sold out..but if you contact Mark himself he will hook you up...dont think there is any ch3 but the new ch2 is lovely ..
Information regarding Manchurian availability is best obtained directly from Mark, by email. Mark is currently on holiday, but will be back in office next Monday, 27th February. Facebook, Twitter and Instagram are the social media sites that Mark uses to announce brushes as they become available. I know that chubby 3 brushes are currently unavailable. Like David suggested, Simpson posts Manchurians on Facebook and Twitter as they come out of production. You then email Simpson to inquire about availability. They can go fast, so it's best to check the social media sites daily. Is the chubby 2 still going to give that wall of badger feel? (02-24-2017, 10:25 AM)Chaddy Wrote: Is the chubby 2 still going to give that wall of badger feel? It is not as big as ch3, but it feels a bit denser in an other way.yes it is a wall of badger because it is very densely packed and seems to have a bit more backbone..ch3 is softer and bigger..and the handle is huge lovely ..i have ch2 and ch3 i like them both and because of that i will always have one of each..